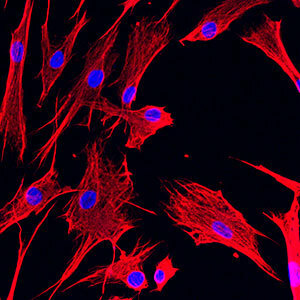 A new paper by a team of researchers led by Zachary T. Schafer, Coleman Assistant Professor of Cancer Biology in the Department of Biological Sciences at the University of Notre Dame, offers important new insights into the role carcinoma-associated fibroblasts (CAFs) play in tumor biology. A number of recent studies have revealed CAFs to be a major contributor to tumor progression through a variety of mechanisms. Despite this information, the precise role CAFs play in augmenting the growth of tumors is still poorly understood. In their new paper, Schafer and his fellow researchers describe a critical role for CAFs in blocking anoikis, a cell death process that inhibits the spread of tumor cells to distant sites, through the secretion of insulin-like growth factor-binding proteins (IGFBPs). They revealed the precise molecular mechanism utilized by IGFBPs to inhibit anoikis: the stabilization of an anti-cell-death protein called Mcl-1. Schafer noted, however, that additional pre-clinical studies are necessary to better understand which IGFBPs might be amenable to target and to determine the precise point during tumor progression that IGBFP inhibition could be effective. This study stems from a V Scholar Award from the V Foundation for Cancer Research that was awarded to Schafer in 2011. Schafer notes that this paper was made possible by the contribution of a diverse and multidisciplinary team of scientists. In particular, the patient CAF samples utilized in this study were obtained through a collaboration with William Kaliney, the executive vice president of the South Bend Medical Foundation. Co-first authorship on this paper was shared by Kelsey Weigel, a graduate student in Schafer’s lab, and Ana Jakimenko, a former postdoctoral fellow in his lab. Additional contributors include Brooke Conti, a Ph.D. student at The Rockefeller University and a 2013 Notre Dame graduate; W. Matthew Leevy and Sarah Chapman from the Notre Dame Integrated Imaging Facility; and Matthew Champion from the Mass Spectrometry & Proteomics Facility and the Department of Chemistry and Biochemistry. The paper was published online on May 7 in the journal Molecular Cancer Research. It can be found at mcr.aacrjournals.org/content/early/2014/05/06/1541-7786.MCR-14-0090.abstract. Originally published by William G. Gilroy at news.nd.edu on May 07, 2014.